The W&J registered their land claim half a decade before the Australian government got serious about its ambition to open up the Galilee Basin, the continent’s largest reservoir of coal. Roughly 400 kilometres inland from the Great Barrier Reef, the region covers an area as large as the United Kingdom, and holds thrice as much coal as has ever been mined in Australia. The International Energy Agency offers some perspective on the scale of the Galilee’s coal deposit: if all of the Basin’s coal were to be loaded onto a single train, it would stretch to a length of 2.5 million kilometres, or six and a half times the distance to the moon. Although the first exploration licence to mine the Galilee was taken out in 1970s by Australian mining magnate Lang Hancock, plans to ‘develop’ the Galilee Basin did not eventuate before the 21st century, owing to both to the region’s remoteness and the need for higher prices and demand for thermal coal. Australia’s recent resource boom, the biggest since the gold rush of the mid-1800s, began around 2003 when prices for coal and iron ore, Australia’s two biggest mining exports, started to rise. Adani embarked on its ambitious Australian mission when the resource boom was at its peak in 2010. Initially estimated to start operations in 2014 and reach full capacity by 2022 to export 60 million tonnes of coal, the Adani mine would be the largest of six megamines, and a total of nine proposed coalmines in the Galilee. The original list of proponents also included the Indian mining company GVK in a joint partnership with an Australian resource giant, Hancock Prospecting. The scale of Adani’s Carmichael proposal promised to put Australia in the same league as the Powder River Basin coalmines in the United States that have an export capacity of up to 100 million tonnes of coal a year. The Basin constituted one of the four “pillars” for Queensland’s growth as envisioned by the state Liberal National Government under Campbell Newman, with an estimated A$60 billion in revenue generation and the creation of 15,000 jobs. Being ‘in the business of coal’, the Newman government subsidised the Galilee megamines through the Galilee Basin Development Strategy. Subsequent Queensland governments also meted out special treatment to the Galilee Basin, and particularly to the Carmichael project, the biggest and the first scheduled to begin. The Labor government that followed Premiere Newman’s Liberal government declared the Adani Carmichael project ‘critical infrastructure’, a status that had never before been granted to a private commercial development, on grounds of its perceived economic benefits, allowing the Coordinator General to reduce red tape and sign off on the various ‘conditional approvals’ for the Carmichael project quickly. The W&J family council refused to grant Adani an ILUA, and the company approached the Native Title Tribunal in April 2015. The company’s 10,000 jobs promise had attracted controversy by this time following the testimony of its own expert in the Queensland Land Court that the forecast was closer to 1464 jobs. The Tribunal, however, ruled in favour of Adani, finding the project in the public interest on account of Adani Australia’s advertised 10,000 jobs figure that both state and federal governments had accepted. The W&J maintained that Adani had misled the Tribunal with false economic benefit claims from Carmichael. The Tribunal authorised Queensland to issue mining licences and the W&J moved to the federal court for a judicial review of the case of mining licences without an ILUA. The Federal Court also dismissed the W&J case. At the third stage of legal appeal from the W&J, the state’s Supreme Court of Queensland also struck down the case. Outside the courtroom, the W&J emphasised that they had struck down Adani’s proposed ILUA on three separate occasions during bona fide meetings of the claim group. 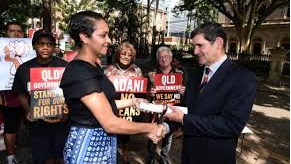 After the W&J family council first formally rejected Adani’s ILUA in March 2015, they took a Defence of Country Declaration which stated their rights as indigenous people under the UNDRIP [United Nations Declaration on the Rights of Indigenous Peoples] to the Queensland Parliament. The W&J pulled out all stops to prevent coalmining on their ancestral lands. The two faces of the campaign, Burragubba and his niece Murrawah Johnson went on a world tour with environmental activists in 2015 to appeal to global investors against the Carmichael project. 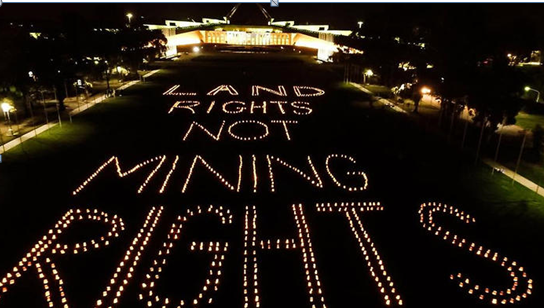 Eleven international banks including HSBC and Barclays committed to not fund Australia’s largest proposed mine on grounds of standing up for indigenous rights, repeated delays in starting the project, and the effects on the Great Barrier Reef. The W&J’s legal track of work against the Carmichael mine continued side by side with its international public campaign. After three unfavourable decisions from various courts, the W&J lodged a case in the Federal Court in December 2016 around how Adani ‘conducted’ a crucial meeting in April where traditional owners voted for an ILUA for Adani. The W&J native title claim group is made up of 12 W&J families. Seven of these families are reported to have voted for an Adani ILUA. The W&J federal case alleged that Adani provided generous travel and accommodation for attendees who voted favourably, that the company ‘stacked’ the meetings with non W&J native title claimants who had never attended a single meeting before. Various allegations of bribery included claims that the company collectively paid more than A$10,000 to the seven pro-Adani family members. For the W&J, a hectic pace in and out of the courts has become the new normal. 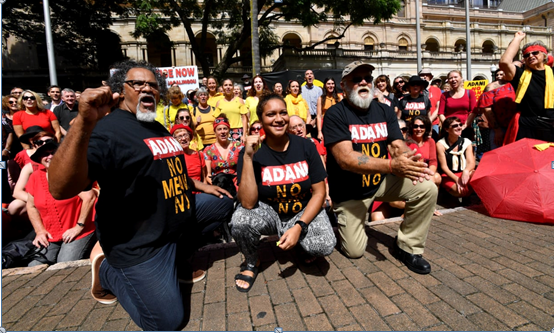 As Adani announced in late November that it will finally begin operations, a small group of traditional owners travelled to Korea to dissuade major financial institutions not to lend to the controversial project. Adani had reportedly been in talks with establishments in Seoul. The W&J received written commitments from Korean banks to not fund the Carmichael project. And then in the new year, the United Nations wrote to the Australian government expressing its concerns about the rights of the W&J. Even though the Carmichael project has now significantly reduced in scale from its original proposed capacity, it still holds the key to the rest of the Galilee Basin’s projects. On several occasions during the last five years, the repeated W&J legal challenges stood as the only legal hurdles in the path of the mine commencing operations, with most other environmental challenges having been ruled unfavourably by courts. Ruchira Talukdar is a PhD scholar at the School of Social and Political Sciences, University of Technology Sydney. Her research compares energy politics and environmental mass movements in India and Australia. The material for this article was collected through interviews during research field trips as well as through a variety of news media.